New reports show that the Billionaire Club is growing faster than ever before, welcoming 145 new members in 2016. Though you and I are unlikely to be among the über wealthy, there are extremely rich people all over the planet. This map shows the richest person on each continent. 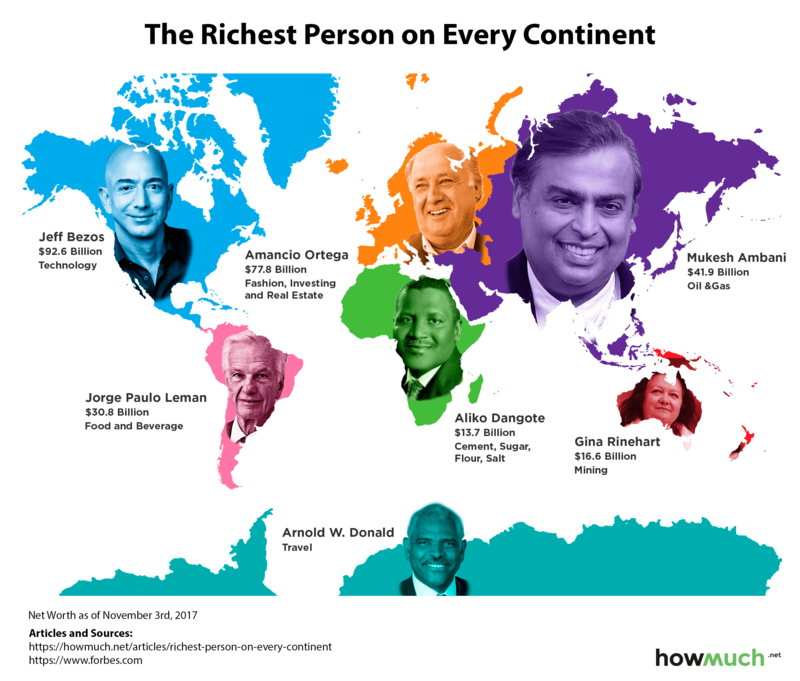 This graphic reveals some interesting information, but you need to remember one thing: these are not the six richest people in the world. Each is the richest on his or her continent, but some continents have much more wealth than others. Take Gina Rinehart as an example. Although she is the richest person in all of Oceania, there are dozens of billionaires with more wealth. In fact, she’s not even the world’s richest woman. Clearly, there is a gender imbalance among each continents’ richest person, but we made some other observations as well. For one, there is ethnic diversity. While our map of richest people in each state was a sea of white faces, the richest people on this map appear to have ethnicities that correspond to their respective continents. The industries are also diverse. Of the twelve industries listed, only real estate appears more than once. What’s more, they shed light onto the economies of each continent. For instance, Aliko Dangote, Africa’s richest man, earned his wealth largely from food staples. Jeff Bezos earned his producing technology products. Reports differ on how many total billionaires exist, but everyone agrees that the U.S. and China have the most. There is still some disparity, though. Right now, the world’s richest person is American. In fact, eight of the top ten call the U.S. home. No Asians are among the top 15. Despite the history of wealth associated with Europe, their billionaire count has remained stagnant. Meanwhile, a new Asian becomes a billionaire every two days. While Antarctica does have valuable natural resource reserves, there are no billionaires living there. In fact, there are no permanent Antarctic residents at all. Still, it is a continent and we didn’t want to nominate a penguin, so we chose Arnold W. Donald as its richest person. As CEO of Carnival Corporation, Donald’s cruise ships make the most profitable endeavors to Antarctica. His net worth eluded us, but it is likely less than $100 million. Editor’s note: In a $7 billion overnight surge, Jeff Bezos became the world’s richest man on October 27, however changing stock prices over the coming weeks could reverse restore Bill Gates to the number one spot.